My Innisfree obsession coupled with trying newer stuff for softer and cleaner feet went to new levels when I spotted this Perfect Clean Foot Range at the Innisfree Store in Galleria Market, Gurgaon. I missed picking up the foot soak and foot balm since I already have a few to finish, but I couldn’t resist picking up this peeling mist and the foot mist because of the novelty they promised and of course, we all need a foot scrub in out lives, ALWAYS!! In this post, I decided to club them all together and share my thoughts about what i feel about these, so read on…. I am quite finicky when it comes to foot care and maybe a bit more than how much I care for my hands. Despite my monthly visits to a salon for professional pedicures, there are times when I feel my feet need some extra love and hence I enjoy doing mini-pedis at home. Just a couple of minutes in a soak and some scrubbing and foot cream and I’m sorted. However, come summers and my foot care regime goes for a toss since the north Indian summers are harsh and dry. The Innisfree Perfect Clean Foot Range has this lovely and soothing mint colored packaging for all the products. Not only they look nice and gentle, but also smell refreshing with scents of jeju lemon and mint extracts. The scent is consistent across all the products. The packaging is simple and fuss free and stuirdy enough to travel with. Perfect clean Foot Peeling mist is the first product I wish to talk about since I love the concept. This product is quite similar to the Green Barley Gommage Peeling that I reviewed on the blog a few weeks back. Except that this is a spray, and a little lighter in consistency. If you have tried the Innisfree Wine Jelly peeling lotion, then this is quite similar in consistency to that one. You only need to spray a couple of times on your feet and massage to roll away dead skin and reveal softer and brighter skin. This is the easiest that it can get with foot care stuff. The effect stays for a good 4-5 days and you can use this stuff just about anytime and anywhere when you feel your feet isn’t looking best. Perfect Clean Foot Scrub is another star product from the line and it is a very granular and coarse textured sugar based scrub with ingredients like macadamia seed oil and fruit extracts. The scrub dissolves away as you massage your feet. While the scrubbing action removes the second layer of dead skin cells (the top layer was taken care of by the Foot Peeling Mist), the fruit extracts and oils in the product make your feet super soft and smooth to touch. Perfect Clean Foot Mist is a light alcohol based foot spray, akin to a facial mist in its soothing properties. It is perfect for carrying in your handbag (I do that!) and at anytime of the day when I feel my feet need a little freshness, I spray it on. It is cooling, with gentle lemon and mint scents and refreshes the feet immediately. However, the effect goes away in like about 10 mins and so I really don’t think this was a good buy. Nonetheless, I am glad to have tried this product since I have never tried any foot mists before, and although I may not repurchase this, I’m currently enjoying using this. 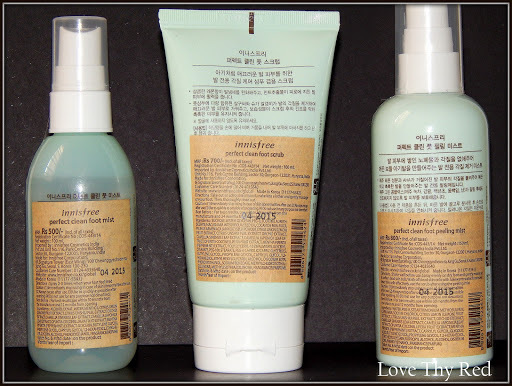 Overall, I am enjoying the Perfect Clean Foot Range by Innisfree and except for the foot mist, i.e. the peeling mist and scrub are definitely going in to my repurchase list. Believe me when I say I haven’t felt the need to go to a salon for a professional pedicure since the last month and a half or so, and that speaks volumes about the efficacy of these products. MUST TRY! !